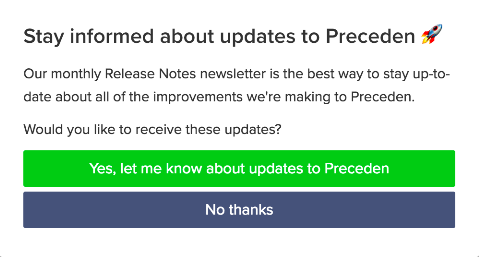 At Preceden we work hard to add new features and options for our users. As these new features are released we'd love to share them with you to keep you up to date. If you are interested in learning about these changes, you can subscribe to our Monthly Release Notes. To do so, click on Account in the top navigation bar. Under Options click Subscribe to Our Monthly Release Notes Newsletter. You will then be signed up to receive the newsletter. You may see the following popup asking if you'd like to subscribe. If you do, simply click Yes or No and you won't see it anymore.